1. In a medium bowl, mix together the yogurt, maple syrup, cinnamon or vanilla seeds. Stir in the blueberries. 2. Lightly grease a shallow baking tray and line with nonstick baking parchment. 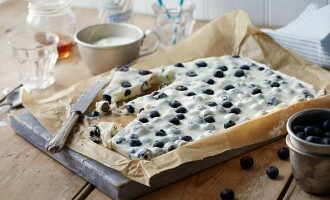 Pour in the mixture and spread out so that the blueberries are evenly dispersed. 3. Cover with cling film and freeze for 2 hours, or until solid. Cut into finger shapes or long triangles and serve immediately.